Two of Nancy’s favorite hobbies were sewing and gardening. More than 20 years ago, Nancy was introduced to landscape quilting techniques by Natalie Sewell, nationally known landscape quilt artist. Natalie and Nancy became best friends and scheduled two or three quilting dates each year. 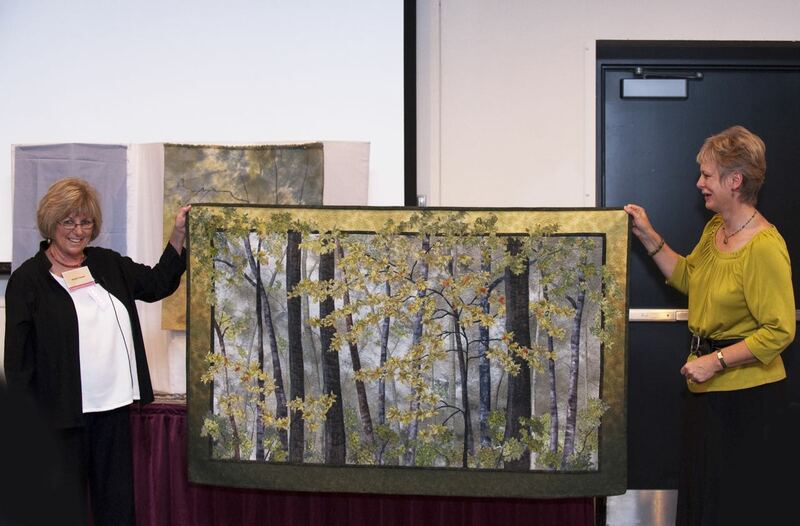 During their final three-part Sewing With Nancy series, Beginning Landscape Quilting, their simplified the process so that everyone interested could enjoy the pleasure of creating outdoor scenes in fabric. Here’s a blog exclusive quilting tutorial on how Nancy created the scene, Wolf River Woods. A photo was used as the inspiration for the design. Nancy did not interpret the design literally—it was used as a guideline. It’s nice to work on a design wall—a layer of flannel and Quilted Iron Quick sewn like a large pillow (without the pillow form) and a casing added at the top, through which you insert a curtain rod. This design wall is portable, although it can be hung year ’round. Three brown trees, one fat and two skinny, are the first elements in the quilt. Roughly cut out the trees and glue them to the background fabric with a paper glue stick. No worries, the glue dries fast and clear and will not gum up your sewing machine. Add texture to the trees by cutting strips of the remaining two bark fabrics and gluing them to the tree trunks. One of the fabrics had a splendid knothole, which Nancy cut out and glued to the fattest tree. After deciding that the light came from the left, she shaded all three trees on the right with a black Sharpie marking pen. Next, she added dark branches to all three trees by cutting skinny strips of her darkest fabric. Then, Nancy began the slow but satisfying process of adding leaves, carefully cut from the large leaf fabric depicted in the photo. After adding many more leaves (mostly red but a few green), Nancy messy cut the two ground cover fabrics, using both their right and wrong sides. To enhance the fall mood, she “diced” up a few of the red and gold leaves with her favorite scissors and sprinkled them on the ground cover. Notice how few leaves it takes to convey a wooded scene in fabric compared with the thousands a photograph would depict. Landscape quilting bends many quilting rules. Messy cutting, fussy cutting, basting with a paper glue stick, and using the other right side of the fabric as well as the traditional right side are just a few of the ways that Natalie and Nancy show you how to be creative with fabric. After designing, tried ’n true quilting techniques take over. The raw edges are basted down using free-motion techniques with clear thread in the needle, the quilt is squared, borders can be added, batting and backing are layered and then are stippled. For more design ideas, watch Beginning Landscape Quilting (Part One, Part Two and Part Three) on Sewing With Nancy online. This fall at Quilt Expo, we’re please to be honoring Natalie Sewell and Nancy Zieman with a Special Landscape Quilt Legacy Exhibit. The Sewell Family from Madison, WI, and the Zieman Family from Beaver Dam, WI, have graciously provided, on loan, a large collection of Natalie’s and Nancy’s Landscape Quilts. The Natalie Sewell and Nancy Zieman Landscape Quilt Legacy Exhibit will be on display at Quilt Expo in Madison, WI, September 6–8, 2018. Their love of landscape quilting brought Nancy and Natalie together. Remember them as you give it a try. Tell us which season you would most like to capture in landscape quilt imagery? Leave your answer in the comment section below for a chance to win two tickets to Quilt Expo, and a copy of the Beginning Landscape Quilting book/DVD from Nancy’s Notions. One winner will be randomly selected. The randomly selected winner of a Trace ’n Create Hobo Tote Bag Template from Clover Needlecraft, Inc., is MaryLou W.
While all seasons have their merits, autumn is always my favorite. I love the crisp smell, the warms sweaters, the hot chocolate! But mostly, the beautiful leaves. My grandchildren know that AUTUMN is my favorite color! The purples, reds, oranges, yellows, and dark greens. As I age, the more I relate to this time of year – not a spring chick, not the blossoming summer, but the most colorful and beautiful. I would choose autumn hands down! It is my favorite season of the year. And the wonderful fall colors would be a joy to work with. I love all of the seasons but I think I’d love to try a nature packed lake scene of Cayuga Lake in the beautiful Finger Lakes of upstate New York. I think I’d like to try to capture the many ways that folks in my area enjoy the lake ( fishing, camping, boating, nature walks, art endeavors etc.) What a glorious quilt this would make! I’d like to do a couple for all four seasons and change them out seasonally. I recently went to a garden tour and took some close up pictures of their lovely roses & dahlias. I’d like to start with incorporating them into a summer quilt. They also had an interesting Japanese garden with lots of interesting trees. They were very unique in shape and I’d like to use them in the background. I would choose to do a winter scene of the view of Lake Erie from my home. I would include our lighthouse and use whites and blues and greys with the contrast of the black bands on our Art Deco lighthouse in Conneaut, Ohio. I would first attempt a Fall scene as above. One day I hope to give it a try as my husband loves the landscape quilts. Since we own a sailboat I may give a Summer evening with a sailboat a try too. I am relatively new to quilting and was given a book by an artist friend in which some exquisite, unique quilts that went far beyond bed coverings were displayed. Now I’ll be able to see how to accomplish some of this beautiful work. Thank you for being a part of my journey into fabric artistry. This is going to be a beautiful, exciting trek with the help of Nancy and Natalie! I feel so fortunate to have been able to take landscape quilt classes from both Nancy and Natalie. They make the “science” of making these wonderful designs look easy. Both of them were “artists” with the design and color ability that I so admire. Both were caring, skilled teachers with the ability to put beginners like me at ease with confidence to do some new techniques. I am currently working on a fall landscape quilt. Years ago I had taken a picture of a fall forest. Finally was able to start my quilt of it this summer. Fall would be my choice to create a landscape quilt. Capturing the blazing, vibrant colors would be stunning in a quilt. Would love to learn how to master this technique. I would choose Fall. I love the colors of Fall. Fall is my favorite time of year because for the different color on the tree leaves. I would love to sew one in a tribute to Nancy & Natalie who turned us on to this . Probably spring to start, but I love the idea of all four seasons of the same scene! I would love to start my first landscape quilt reflecting the beauty of the northwoods where I live. Fall is coming, the most beautiful time here. Would love to learn how to make a landscape quilt, and would love to see the exhibit at the expo. what design skill and ability to delivery with such creativity Looking forward to challenging myself sometime soon with the colour of the Australian bush. Have not captured a photo yet that I would want to work with. I would be a hard choice to choose a season, but I think it would be either fall or spring. Landscape quilt with mountains and a hut, some trees in the Fall. I’m torn between wanting to create a spring scene or an autumn scene. These are my two favorite seasons, but each has its own amazing attributes. Maybe a four-panel quilt of the same, identical scene in all four seasons is in order. You know what they say: so many design ideas…so little time! I would love to do a quilt of the beach scene since I love the gulf coast. I would like to make a landscape quilt of my pond in the winter. Wwe recently moved away from the Pacific Northwest and I would love to depict the Olympic Peninsula on a foggy early summer morning. Enjoying the damp aromatic foliage while sipping a hot cup of coffee was a favorite pastime. I would make a spring landscape quilt. I love the flowers and fresh colour of the season. I would love to attempt a landscape quilt in fallasleep colors. I am from the Home of Arbor Day, Nebraska City, Nebraska, and would love to make a quilt to exhibit my love for the colorful fall trees. Since I love all of the seasons, I would like to make a wall quilt with all four seasons depicted. I have always admired landscape quilts and would love to make one for autumn. The fall colors are spectacular. Thanks for the great giveaway! I am anxious to start a landscape for Fall. I can never get the colors out of my mind from my visit to Canada so many years ago. It astounded me how fuchsia colored leaves were everywhere I looked! Most beautiful sight I had ever seen,…except for the northern lights, that was in Canada too. What a breathtaking place to live. I want to replicate that fuchsia vision in a landscape wall hanging…..
Fall colors are beautiful. Always wanted to try a landscape quilt but never got my nerve up. Thank you for carrying Nancy’s lessons for learning on for all of us who loved and followed her! I would do a summer quilt. Near me is a very old bib oak with a branch thrusting out touching the ground. I will take a picture of it and try to duplicate. It has always facinated me and is similar to one I used to sit on when very young in the northern part of Michigan, where I am from. I would love to create and stitch a Spring landscape quilt based on my real garden. I would love to create a Spring landscape quilt using my real garden as my inspiration. What a keepsake it would become! I would love to create a fall landscape quilt! Both of these ladies were great teachers and are surely missed! I am thrilled that the Expo will be having a showing of some of Nancy’s quilts. A wonderful honor in memory of a wonderful lady. I love fall and my quilts, clothes and home reflect those colors. I’d probably have to say winter, with some white and gray trees with red berries hanging from them. When is the drawing? I would choose a winter scene since I am not very creative. Maybe this scene would be easier for me to do. This type of quilting is very fascinating to me but also scares me a little. Am salivating to finally be able to do a landscape scene. The directions are really good and workable with my stash! I would love to do a winter scene with glistening snow covered tundra, bare trees with icycles along a river with a partially frozen waterfall and mountains in the background. I loved the 3 part series on landscape quilting. I love the awakening colors of spring. Would like to create landscape quilt project inspired by that. Autumn in Minn is beautiful, same as in Wisconsin, so that is what I would depict. Unfortunately here in Texas, autumn colors are yellow and brown – ugh – so I will have to look back thru old photos from when I lived there nearly 50 years ago, or go on line for some. I’d love the challenge of a winter landscape ~ the blues, grays, and whites would be interesting for depth and mood. Being married to a long-time sailor, I would choose a Fall scene of a battleship leaving port for a long deployment while a “lone sailor” keeps watch. This would make a beautiful gift for my husband. I would love to try to do a fall quilt. I’ll definitely need to think about this as I would love to have a pumpkin in the scene. Summer along the shores of Lake Michigan with dune grass surrounding chairs. I would definitely do a fall scene as I love the reds, golds and browns of fall colors. This book and DVD would be wonderful tools for me to get started with landscape quilting. Definitely fall, my favorie time of year when the leaves turn and we have lovely cool weather to go for hikes in the woods. I would love to make a Fall landscape quilt/ I love the colors of Fall and know they would make a beautiful landscape quilt. I would choose winter. It’s my favorite season! To choose one, it would be fall with the interesting colors and the light. A four season project has always been on my to-do list. When I work on this project, I will choose a “scene” and show it in all four seasons. I’d like to try early spring. I’m so glad, that along with Nancy, Natalie will also be remembered. I was saddened when she too passed. It would have to be Spring, with all the new blossoms & green foliage! I like winter and the contrast of white snow on dark trees after a new fallen snow. I would do either fall or spring! Fall lends so many colors to the leaves and the background! But spring has so many beautiful flowers in bloom that the color options are endless!! My favorite is spring and early summer, I also enjoy the southwest desert. Easy question!!! My great love of Fall supplies the quick answer. I cant wait to head out and find new places to photograph every year. I have amassed a great collection of Fall pictures that would be the perfect jumping off point!! I have hunted the exact ombre fabric Nancy used in you of her landscape quilts. There is nothing in the world to compare to the colors God sprinkles all over the country in the Fall of the year. Its still so hard to fathom Nancy isn’t among us today. She was an amazing talented woman, one of the greatest. Although each season has it’s own beauty, from the stark monochromatic vision of winter to the wild color of summer flowers, I still like the richness of fall foliage. There’s something magical about the leaves turning and the crops coming in. Thank you, Nancy and Natalie, for the method of capturing these scenes with fabric. I’m thinking of the colors of Spring, the dogwood, the flowering fruit trees, the many flowers and bushes. Can’t leave out the greenery. I like Summer. I just returned from Washington Island, WI. I took photos of scene from People’s Park. I like that fence! I did do this when I first saw the show many years ago, I did a fall version. Would love to have the book and tickets. Snow on trees make a good picture when the snow first begin. Fall is a lovely time, also. It”s hard to choose which season I would like for the quilt, but I think I would go with fall first and winter a close second. I love this concept. I wish I lived closer so I could attend the exhibit. I live in Florida. I would like to make a four season’s landscape quilt for a friend. I have the pictures and I’m looking for ideas. Is this something you can help with?